The Billionty-Oneth Geek: Retro Rebound: Chip n' Dale Rescue Rangers!!!! Retro Rebound: Chip n' Dale Rescue Rangers!!!! Back in the Fall of 2004, I was in my second year of university living at a college residence. I remember one night during dinner, me and a group of friends were talking about Disney cartoons that we used to watch. 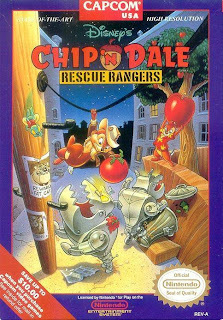 I brought up that I used to love Chip n' Dale Rescue Rangers. I also brought up that I used to have a crush on Gadget, the female mouse. Keep in mind that I was 6 years old at the time. My friends had a good laugh at my expense. And I'm not going to lie, I did have a crush on her. I thought she was cute. Not only that, she had brains and wits, not to mention she was an engineer. What's not to love? So she was a rodent... BIG DEAL! I freaking loved this game when I was a kid and having played through it again recently, I think I still do. I never owned it though; I would borrow it from my childhood friend's that did own it. Based on the Disney cartoon from the early 90's, you play as Chip and/or Dale as they thwart another one of the evil Fat Cat's diabolical plans. Along the way, you're aided by your trusty pals, Gadget, the female rodent, Monty, a fat cheese loving mouse, and the awesome Zipper, the super power fly. It's another classic side-scrolling action game developed by Capcom. It's fun because you can play with 2 player at the same time, an option that was limited back then. Hijinks ensues when you toss berries or boxes at your friend, stunning them, making them viable targets for the enemies. Oh the fun! Along your adventure, you'll encounter all sorts of enemies including miniature robots, critters and a slew of the staple villains from the cartoon. Actually the one that boggled me was the lizard dude who was one of Fat Cat's henchmen. Instead of being a boss, he was just a normal enemy, like a Goomba or something. So you'll see many of the lizard guy throughout the game. Anyhow, I thought it was odd. On top of that, it has a catchy soundtrack throughout that still resonates with me today (I think I remember more music from the 8-bit days than newer games these days). The game was not without it's flaws though. The stupidest thing about the game is the level selection map. Examine below. If you see the blimp on the top right of the map, that's where you start. You want to get to G. The first choke point you need to get to is Point D. So to get to D, you could take route B-D or route A-C-D. Now, why would you go through route A-C-D if B-D is the quicker way? That's one more level to tack down that you don't need to. Also, look at the placement of Point E. It's redundant! Ahh, the old days of "non-linear" games. I forgive thee. Anyhow, this is a fun game and it'll forever live in the fond memories of my childhood. Peace out geeks! Jeff, are you also the one who didn't know bambi was a...male? LOL, no, I knew he was a male. But remember, I said I used to think his female deer counterpart was cute... and then you found a picture of her and made it your wallpaper? LOLz. I loved watching Chip and Dale Rescue Rangers!!! Yay for more commonalities from the Feb '83 babies!